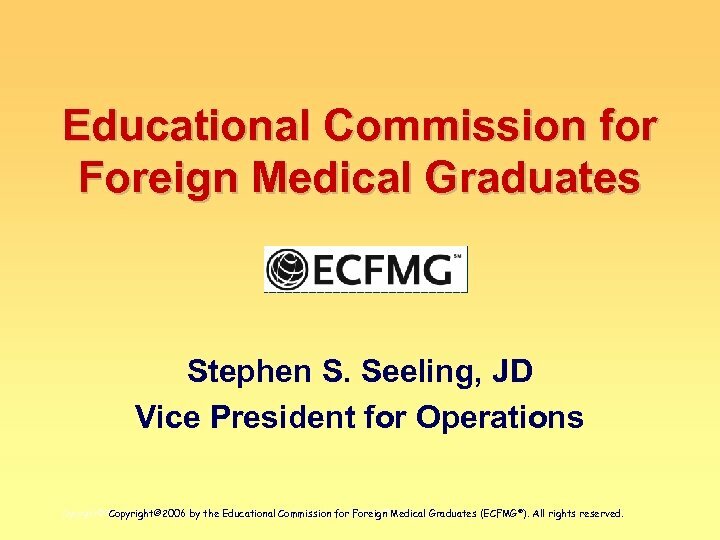 Educational Commission for Foreign Medical Graduates Stephen S. Seeling, JD Vice President for Operations Copyright© 2006 by the Educational Medical Graduates (ECFMG ®). All rights reserved. Copyright© 2006 Commission for Foreign All rights reserved. 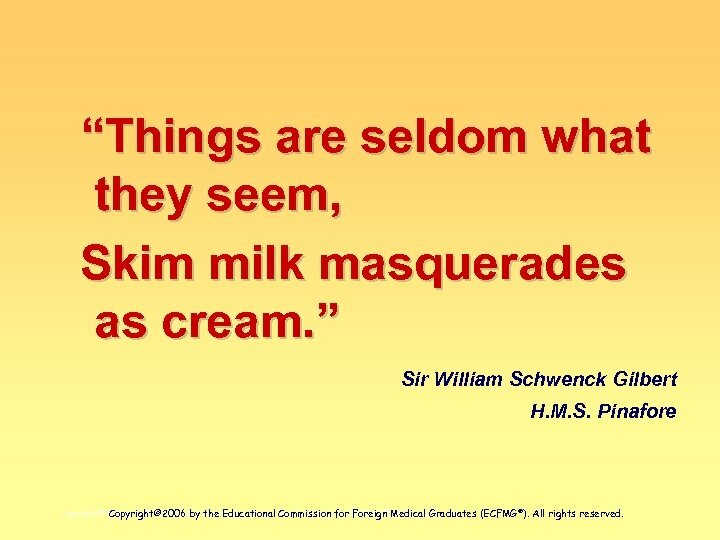 “Things are seldom what they seem, Skim milk masquerades as cream. 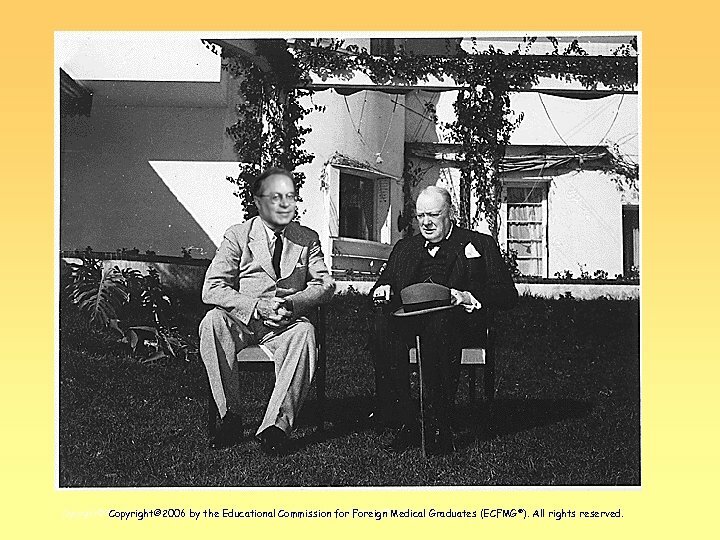 ” Sir William Schwenck Gilbert H. M. S. Pinafore Copyright© 2006 by the Educational Medical Graduates (ECFMG ®). All rights reserved. Copyright© 2006 Commission for Foreign All rights reserved. – www. 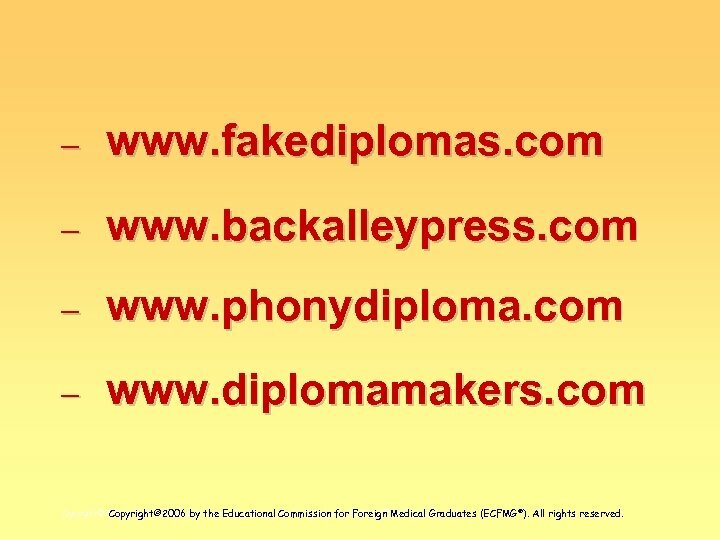 fakediplomas. com – www. backalleypress. com – www. phonydiploma. com – www. diplomamakers. com Copyright© 2006 by the Educational Medical Graduates (ECFMG ®). All rights reserved. Copyright© 2006 Commission for Foreign All rights reserved. 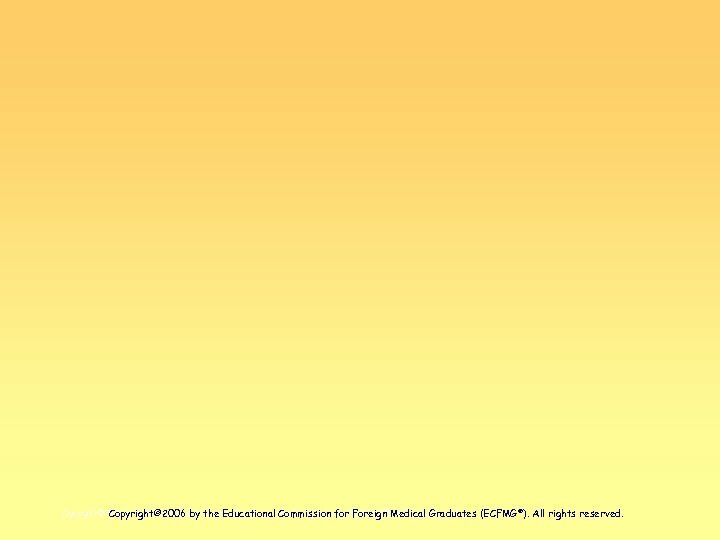 Copyright© 2006 by the Educational Medical Graduates (ECFMG ®). All rights reserved. Copyright© 2006 Commission for Foreign All rights reserved. 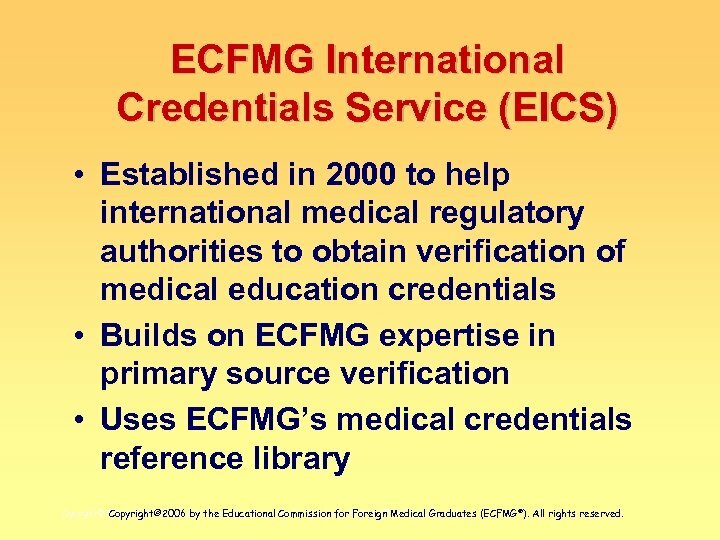 ECFMG International Credentials Service (EICS) • Established in 2000 to help international medical regulatory authorities to obtain verification of medical education credentials • Builds on ECFMG expertise in primary source verification • Uses ECFMG’s medical credentials reference library Copyright© 2006 by the Educational Medical Graduates (ECFMG ®). All rights reserved. Copyright© 2006 Commission for Foreign All rights reserved. 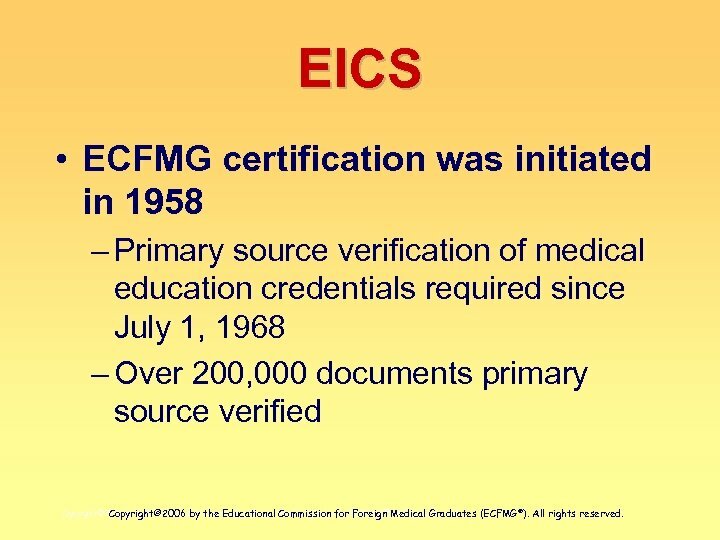 EICS • ECFMG certification was initiated in 1958 – Primary source verification of medical education credentials required since July 1, 1968 – Over 200, 000 documents primary source verified Copyright© 2006 by the Educational Medical Graduates (ECFMG ®). All rights reserved. Copyright© 2006 Commission for Foreign All rights reserved. 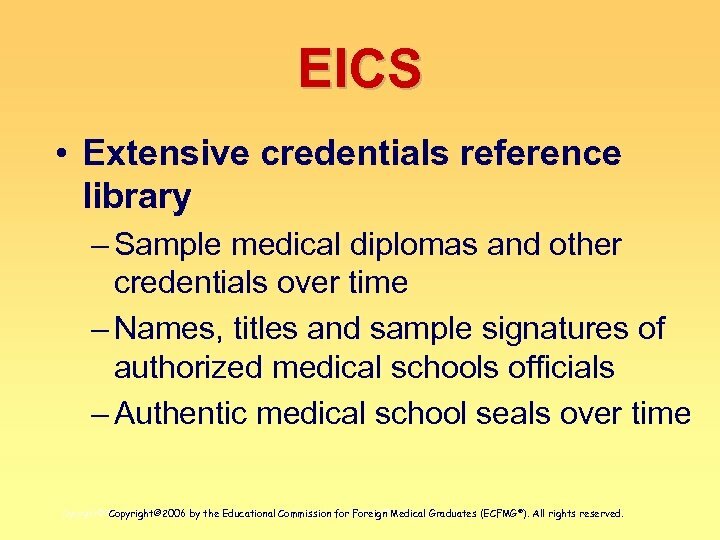 EICS • Extensive credentials reference library – Sample medical diplomas and other credentials over time – Names, titles and sample signatures of authorized medical schools officials – Authentic medical school seals over time Copyright© 2006 by the Educational Medical Graduates (ECFMG ®). All rights reserved. Copyright© 2006 Commission for Foreign All rights reserved. 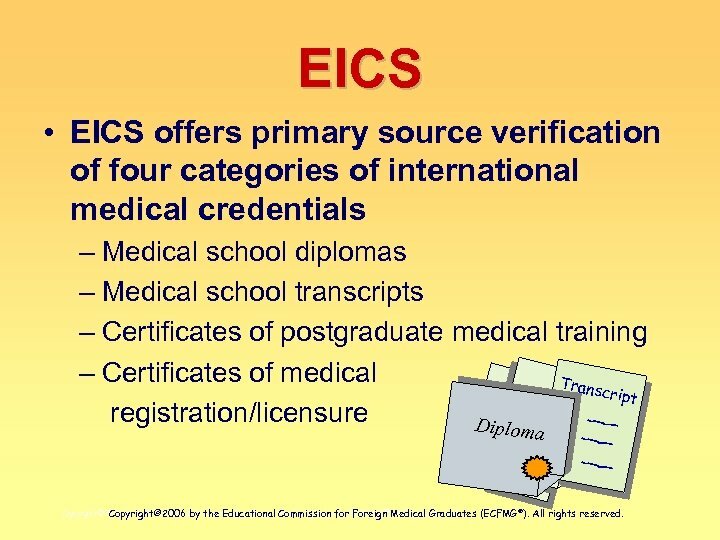 EICS • EICS offers primary source verification of four categories of international medical credentials – Medical school diplomas – Medical school transcripts – Certificates of postgraduate medical training – Certificates of medical Trans cript registration/licensure Diplo ma Copyright© 2006 by the Educational Medical Graduates (ECFMG ®). All rights reserved. Copyright© 2006 Commission for Foreign All rights reserved. 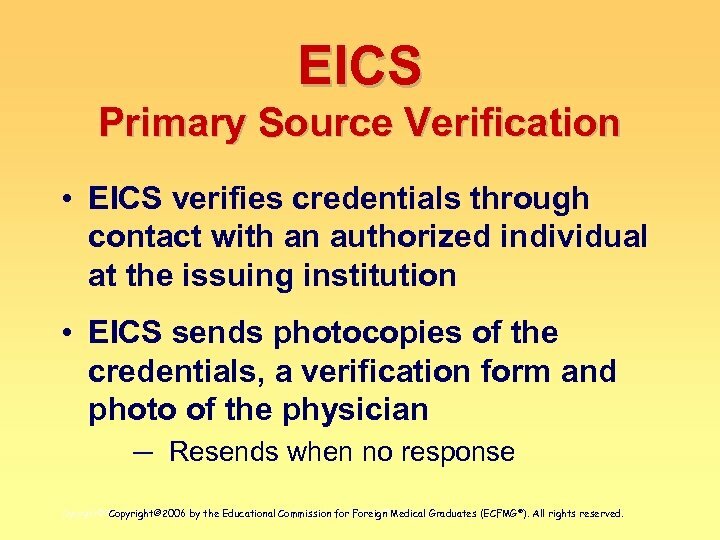 EICS Primary Source Verification • EICS verifies credentials through contact with an authorized individual at the issuing institution • EICS sends photocopies of the credentials, a verification form and photo of the physician ─ Resends when no response Copyright© 2006 by the Educational Medical Graduates (ECFMG ®). All rights reserved. Copyright© 2006 Commission for Foreign All rights reserved. 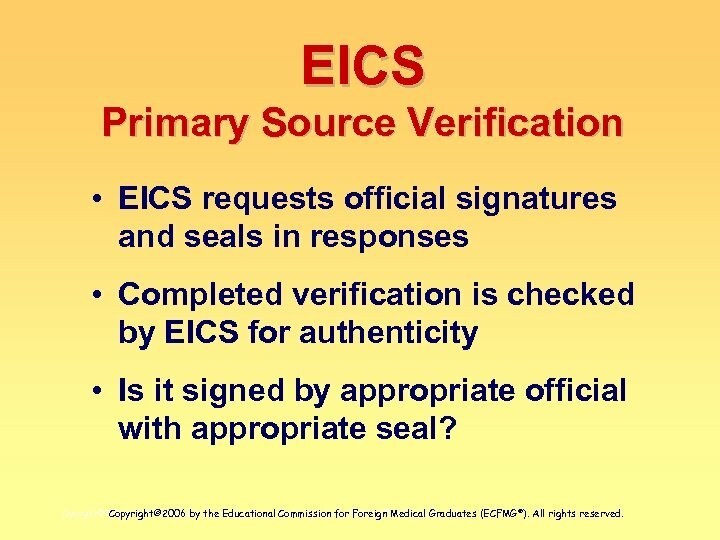 EICS Primary Source Verification • EICS requests official signatures and seals in responses • Completed verification is checked by EICS for authenticity • Is it signed by appropriate official with appropriate seal? Copyright© 2006 by the Educational Medical Graduates (ECFMG ®). All rights reserved. Copyright© 2006 Commission for Foreign All rights reserved. 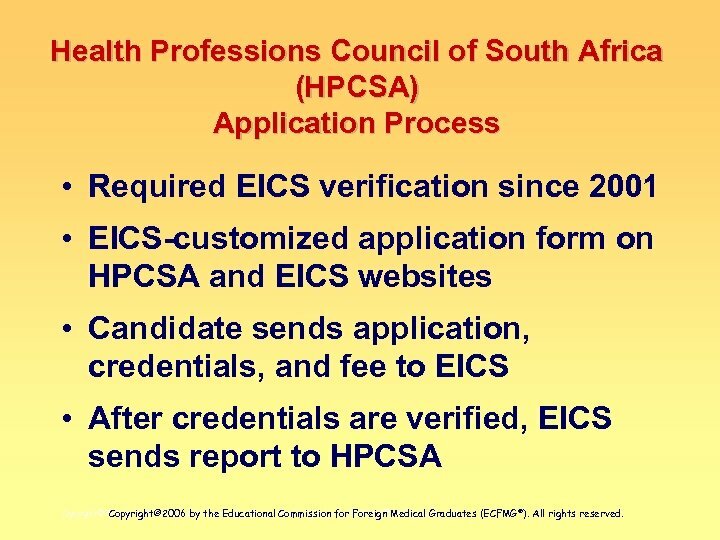 Health Professions Council of South Africa (HPCSA) Application Process • Required EICS verification since 2001 • EICS-customized application form on HPCSA and EICS websites • Candidate sends application, credentials, and fee to EICS • After credentials are verified, EICS sends report to HPCSA Copyright© 2006 by the Educational Medical Graduates (ECFMG ®). All rights reserved. Copyright© 2006 Commission for Foreign All rights reserved. 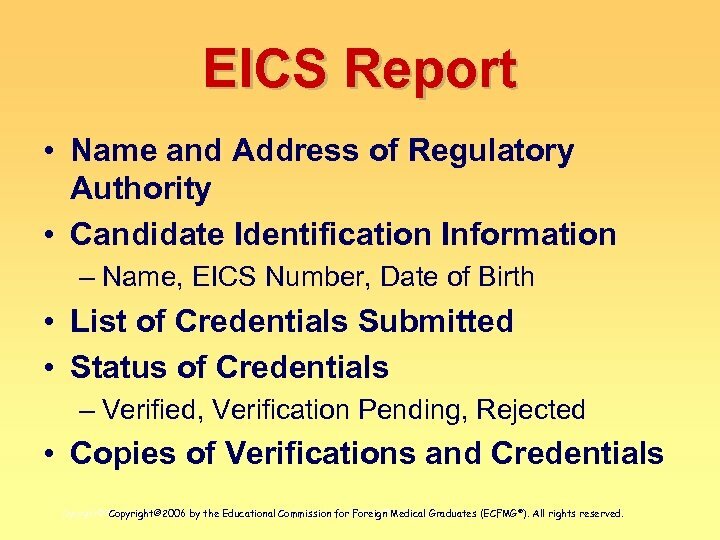 EICS Report • Name and Address of Regulatory Authority • Candidate Identification Information – Name, EICS Number, Date of Birth • List of Credentials Submitted • Status of Credentials – Verified, Verification Pending, Rejected • Copies of Verifications and Credentials Copyright© 2006 by the Educational Medical Graduates (ECFMG ®). All rights reserved. Copyright© 2006 Commission for Foreign All rights reserved. 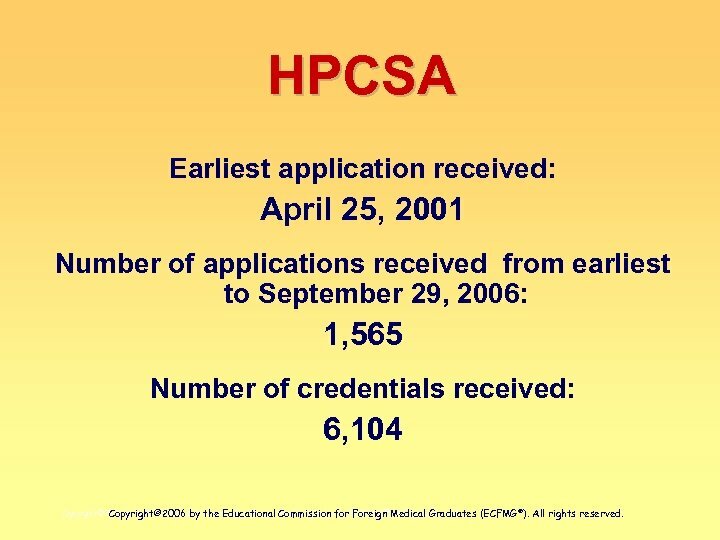 HPCSA Earliest application received: April 25, 2001 Number of applications received from earliest to September 29, 2006: 1, 565 Number of credentials received: 6, 104 Copyright© 2006 by the Educational Medical Graduates (ECFMG ®). All rights reserved. Copyright© 2006 Commission for Foreign All rights reserved. 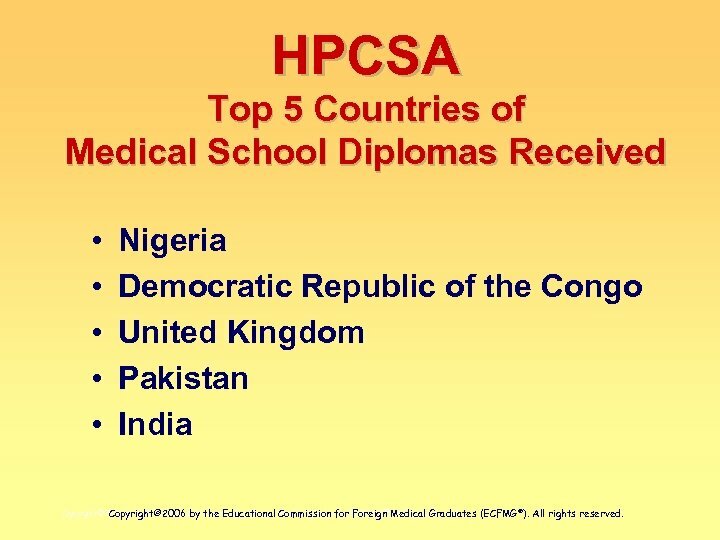 HPCSA Top 5 Countries of Medical School Diplomas Received • • • Nigeria Democratic Republic of the Congo United Kingdom Pakistan India Copyright© 2006 by the Educational Medical Graduates (ECFMG ®). All rights reserved. Copyright© 2006 Commission for Foreign All rights reserved. 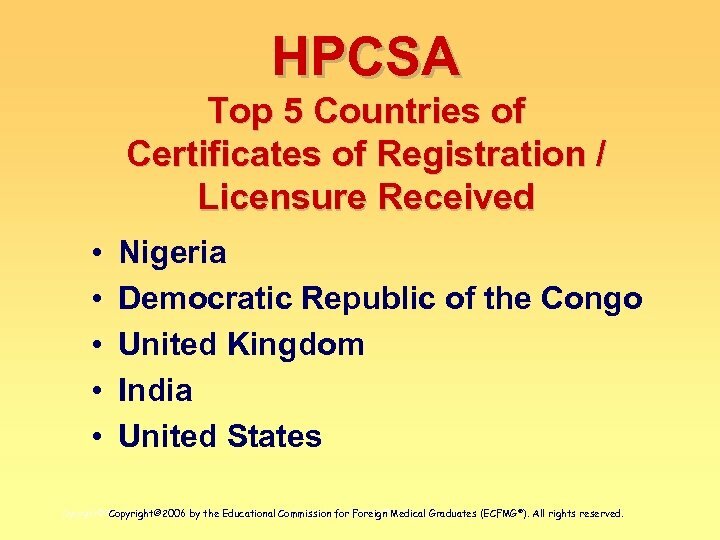 HPCSA Top 5 Countries of Certificates of Registration / Licensure Received • • • Nigeria Democratic Republic of the Congo United Kingdom India United States Copyright© 2006 by the Educational Medical Graduates (ECFMG ®). All rights reserved. Copyright© 2006 Commission for Foreign All rights reserved. 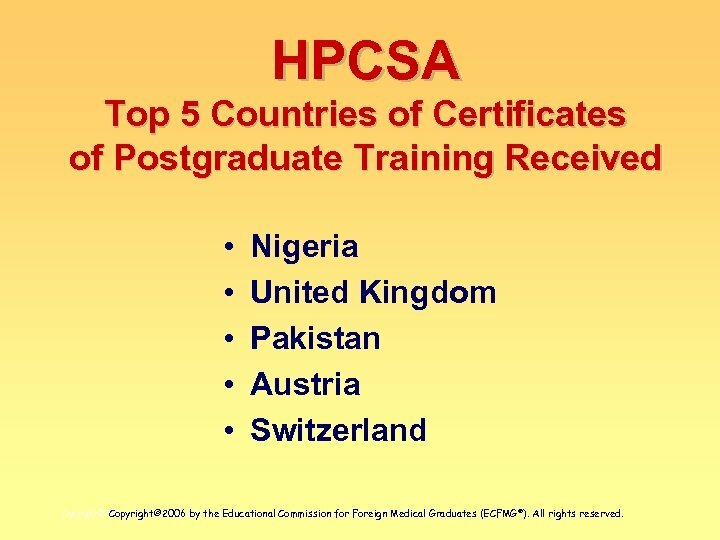 HPCSA Top 5 Countries of Certificates of Postgraduate Training Received • • • Nigeria United Kingdom Pakistan Austria Switzerland Copyright© 2006 by the Educational Medical Graduates (ECFMG ®). All rights reserved. Copyright© 2006 Commission for Foreign All rights reserved. 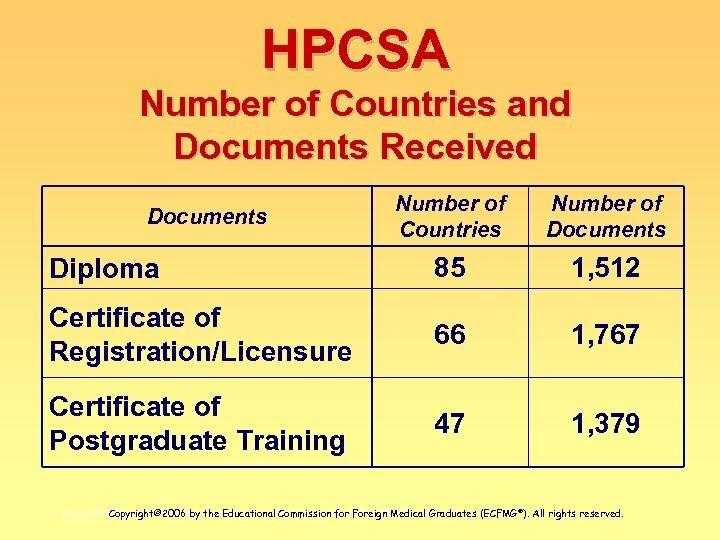 HPCSA Number of Countries and Documents Received Number of Countries Number of Documents Diploma 85 1, 512 Certificate of Registration/Licensure 66 1, 767 Certificate of Postgraduate Training 47 1, 379 Documents Copyright© 2006 by the Educational Medical Graduates (ECFMG ®). All rights reserved. Copyright© 2006 Commission for Foreign All rights reserved.